The team of Lauren Frohne, Corinne Chin and Ken Lambert of The Seattle Times won first place in the Associated Press Sports Editors 2015 contest in Short Video for the 75-175,000 circulation category. The team from The Seattle Times won for the video “What does 12 mean to you?,” a video asking fans of the Seattle Seahawks what it means for them to be the 12th Man. 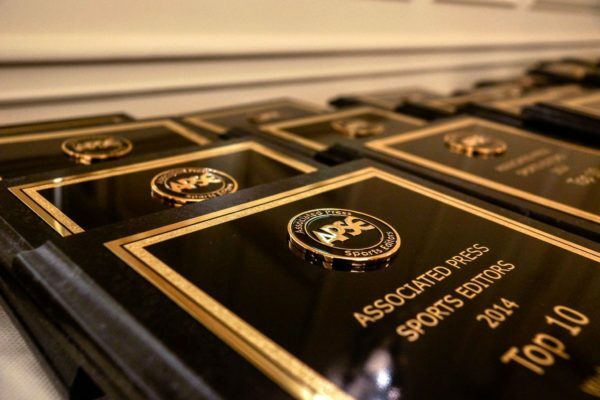 The team will be presented a first-place plaque at the 2016 APSE banquet. The banquet and awards dinner concludes the APSE Conference June 22-25 at The Omni in Charlotte, N.C. The contest was close as all three placing videos had two first-place votes. Larry McCormack of The Tennessean finished in second place, followed by the staff at the Austin American-Statesman. Sports editors in the 75-175,000 category submitted 10 short video entries. The contest is open to APSE members. Click here to join. Contest chair Tommy Deas numbered each entry, assuring they had been stripped of headlines, graphics, bylines and any other element that would identify the writer or news organization. In late February and early March, preliminary judges at the APSE Winter Conference at Poynter Institute in St. Petersburg, Fla., selected a top three, with each judge ranking the entries in order from 1 to 3 separately on a secret ballot. Entries were given 3 points for a first-­place vote, 2 points for second and 1 point for third place. The final 3 were given to a second judging group, which ranked the entries 1-3 in the same fashion. The winner and final rankings are determined by tallying the ballots. This was the first year video was separated from other multimedia. There was a category for video less than 2 minutes and another for video more than 2 minutes. Entries were judged on strength of storytelling as well as visual and auditory quality. Each news organization was limited to one entry.